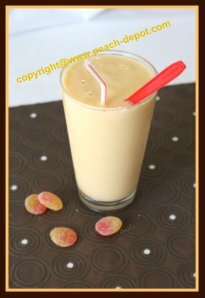 Make a Frozen Peach Smoothie Recipe with Yogurt, Skim Milk and (Optional) Whey for a lip-smacking fruit smoothie treat! My daughter decided to make a smoothie today, and, using the peaches we froze for our "smoothie supply", she created this simple smoothie for lunch for both of us ... thanks Karissa! Not only is the taste amazing, but fruit smoothies and nutritious too! 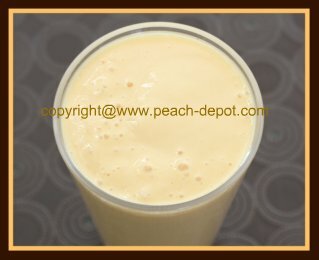 If you are searching for a great peach smoothie to make, you have found a good choice here! In a blender, add the frozen peaches and the water, and blend to chop and mix. Add the yogurt, skim milk powder, whey protein (optional), and the almond extract. ENJOY this Amazing Smoothie Recipe! If you enjoy making healthy smoothies at home, use the link below for helpful tips on how to make the best smoothies! Not only do peaches taste delicious, but they are nutritious too! Peaches contain many important nutrients and vitamins, including Vitamin C, Vitamin A, Beta Carotene, Potassium, Fluoride and Iron. Peaches are a also a good source of dietary fibre, and they are high in antioxidant activity.